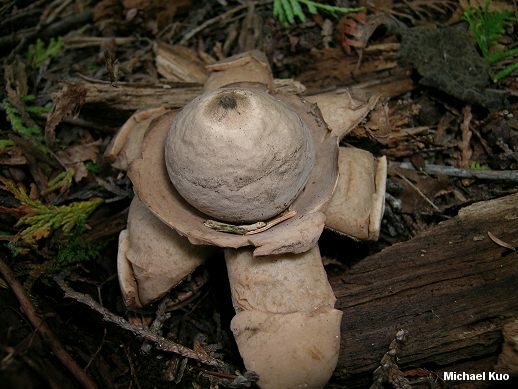 This large earthstar features very thick arms that often develop cracks and fissures as they bend, eventually splitting so that the spore case appears to be sitting on a saucer that is held up by the curled arms. 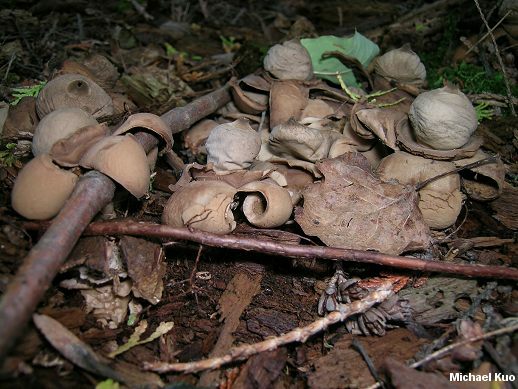 However, Geastrum triplex doesn't always form a saucer, and other distinguishing features must then be matched for accurate identification: the large size; the pronounced "beak" on young specimens; the fuzzy opening in the spore case (which is usually surrounded by a paler area); and the fact that the mushroom is attached to the substrate only at the base. 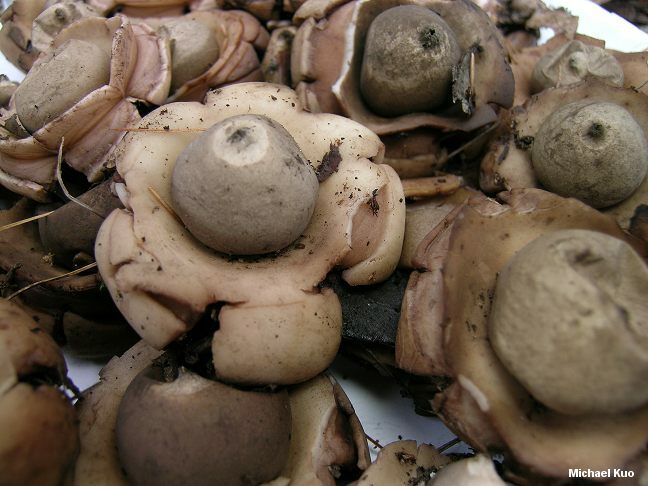 Geastrum indicum is a synonym, according to some mycologists. Ecology: Saprobic; growing alone or gregariously under hardwoods; summer and fall (over winter in warmer climates); widely distributed in North America. Fruiting Body: At first a smooth, egg-shaped ball with a prominent pointed beak, 1-5 cm wide, attached to the substrate by a point at the base; with maturity the outer skin peeling back to form 4-8 more or less triangular, buff colored, non-hygroscopic arms that are thick and usually develop fissures and cracks, frequently splitting to form a saucer; spore case more or less round, smooth, brownish, with a fuzzy conical beak that is often surrounded by a pale area; 5-10 cm across when arms are opened; interior of spore case initially solid and white but soon powdery and brown. 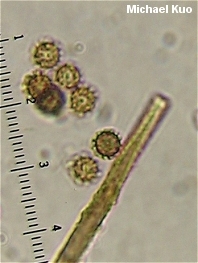 Microscopic Features: Spores 3.5-4.5 µ; round; spiny; brownish to cinnamon in KOH. Capillitial threads 3-6 µ wide; yellowish in KOH; incrusted. REFERENCES: Junghuhn, 1840. (Saccardo, 1888; Coker & Couch, 1928; Smith, 1951; Ponce de Leon, 1968; Smith, Smith & Weber, 1981; Arora, 1986; Phillips, 1991/2005; Lincoff, 1992; Horn, Kay, and Abel, 1993; Barron, 1999; Roody, 2003; McNeil, 2006; Miller & Miller, 2006.) Herb. Kuo 09130702.